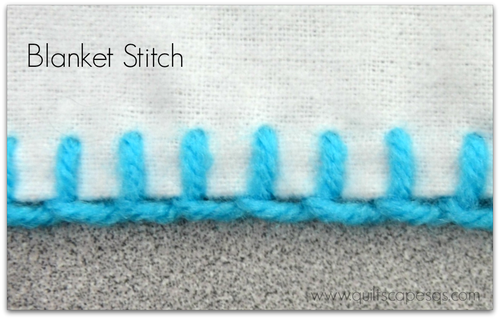 Today's vintage stitchery lesson is one of the very most practical, basic stitches: the Blanket Stitch. 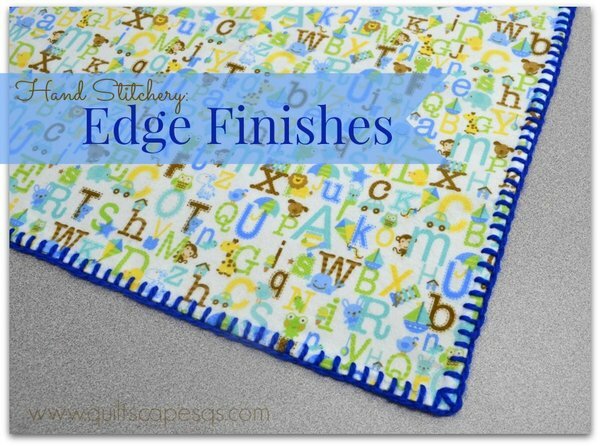 It makes a great finish on applique' or the edge of a blanket (hence the name). 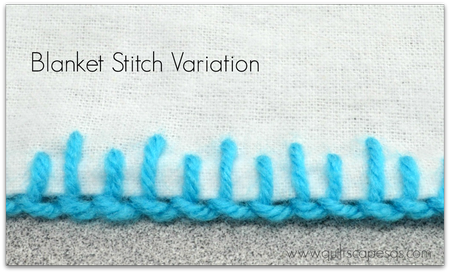 We'll try this simple stitch plus a couple of variations, then try her cousin, the Buttonhole Stitch. 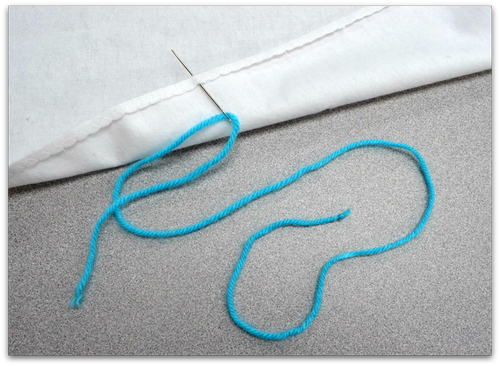 Cut a length of yarn (about 30") and thread your needle. 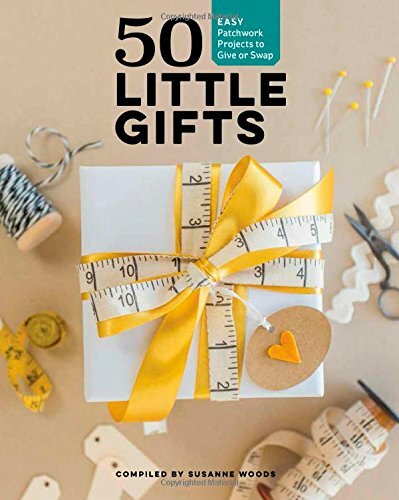 You may want to fold over the edge of the yarn, squeeze between your thumb and finger, then push the eye of the needle over the pinched yarn to bring it through. Tie a single knot at the bottom and trim close to the knot. 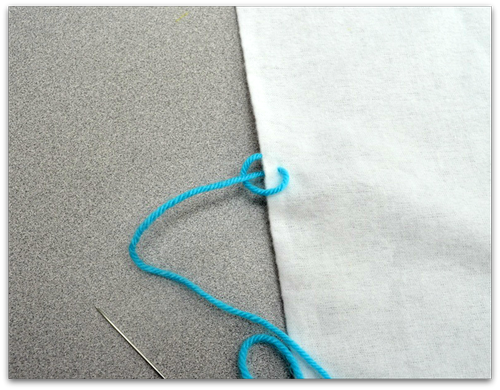 Step 1) Begin by bringing thread out at the edge (A). about 1/4" away from the first stitch (B). Needle will be pointed toward outside edge. Step 3) Loop the yarn under the needle at the edge of the blanket. Step 4) Pull the needle through the loop of yarn. Pull and adjust so both the stitch and the yarn at the edge are snug. (top to bottom) if you're right-handed. To turn a corner, take 3 stitches into the same spot as pictured. 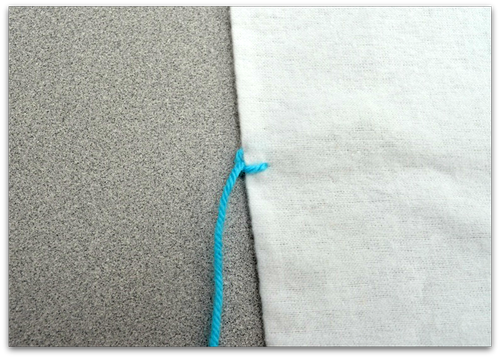 To tie a knot, take the yarn down into the fold just after a stitch. comes out just in front of the previous stitch. 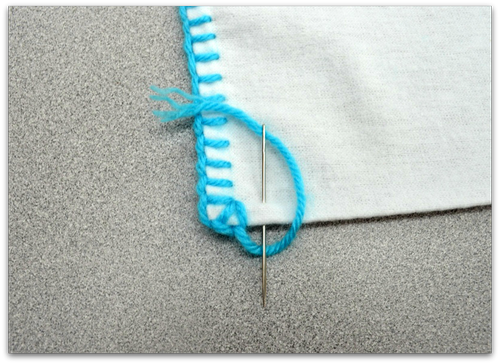 complete the stitch, then tie off the thread, hiding the knot in the fold. 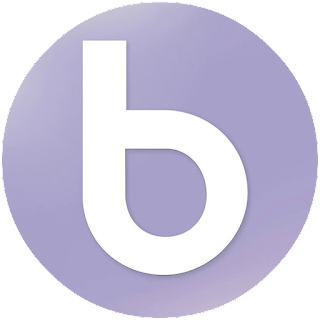 Both of these versions take a bit of fiddling and adjusting, but can make a nice look overall. Step 1) Begin as before - bring yarn out at the edge (A). about 1/4" away from the first stitch (B). 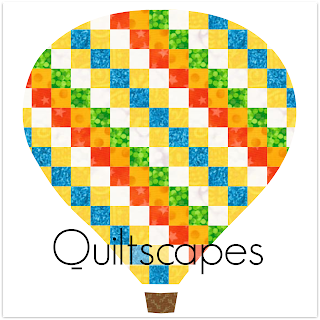 Needle will be pointed toward quilt center. 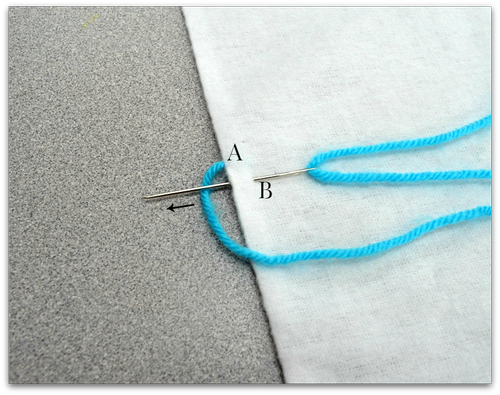 and bring the yarn under the needle where the tip comes up (C). 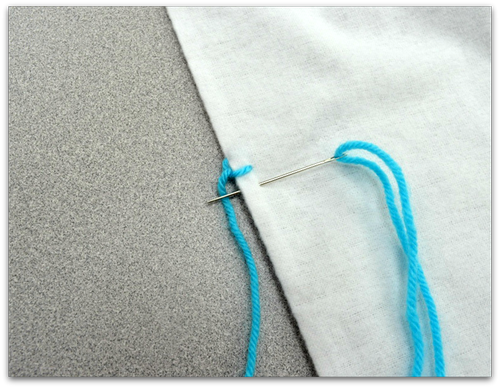 Step 4) Pull needle through the front of the blanket. 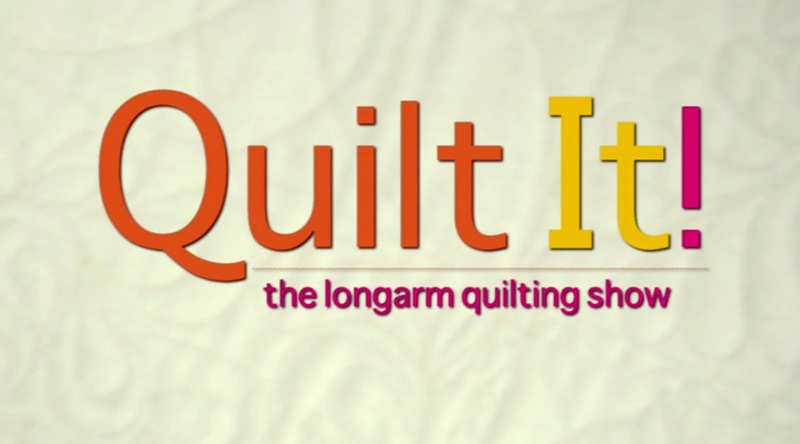 As you pull to bring the yarn snug, a second loop (knot) will form at the outer edge. Continue around the blanket in this manner working left to right. then tie off the thread, hiding the knot in the fold. Use extra scraps to make a burp cloth. Cut 2 rectangles, about 8 to 10" x 16". Trim in an hourglass shape, or leave as a rectangle. Layer wrong sides together and stitch the edges together (serge or zig-zag). 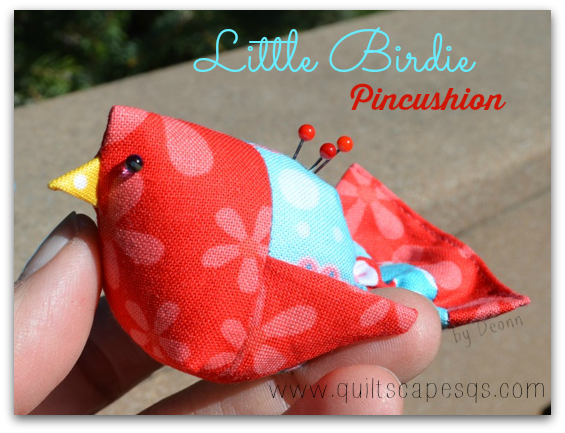 Trim with blanket or buttonhole stitches. 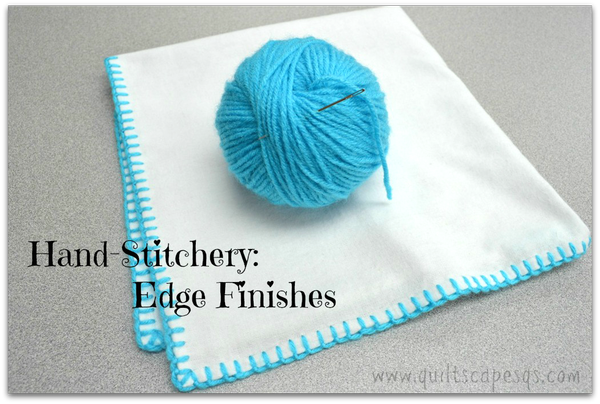 For those who love to crochet and don't have access to a Hem-Stitcher, this is the perfect way to prepare your blanket or burp cloth for additional crocheted finishes. 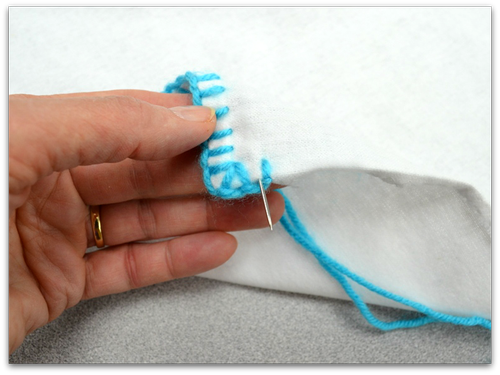 Use the Blanket Stitch with floss to hand-stitch applique' for a fun primitive look. 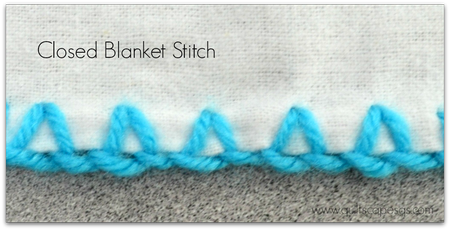 I've tried it from time to time, but I have to admit, the blanket stitch is my go-to for applique' by machine. 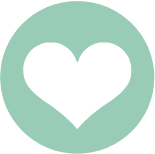 Check it out in a previous tutorial: I ♥ Applique'. By the way, check this little tutorial How to roll a (tangle-free) ball of yarn. Hope you enjoy this technique! Let me know if you try this, or if you have any questions. 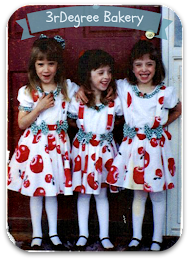 See more of my stitchery and other sewing/quilting basics tutorials right here on my Tutorials page.